I am fifty today. Turning 30 was devastating, 40 was liberating, and 50... well, I'm not sure yet. When I tell my kids I'm now old, they just tell me I'm only at the half way point in my life. 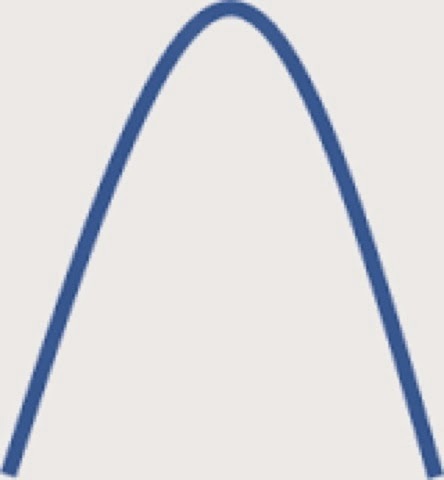 Interestingly, that made me think of a parabola or a bell curve in which the apex occurs at 50. The optimist in me looks and says, "from now on, life is easy." The pessimist in me says, "Everything from now on is in decline." It's silly. Fifty is just a number, I tell myself, but I can't help but wonder which version it will be. I have a gut feeling that 50 is going to be a good year. 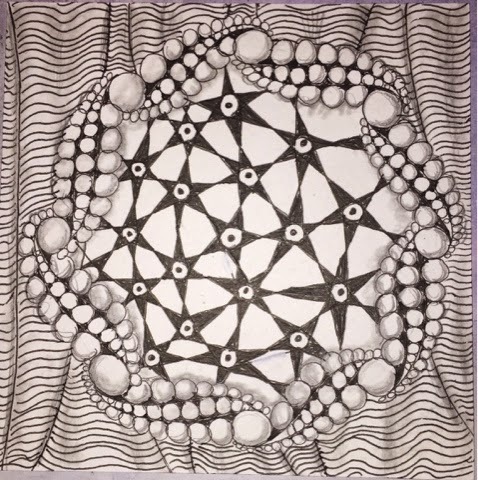 I worked on two pieces of art the last two days. The one above will become a part of my Woman of Wonder series. 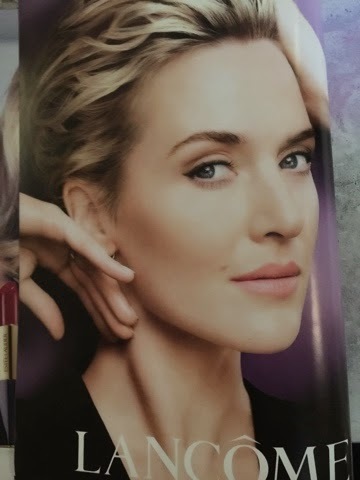 I used an ad from a magazine as my inspiration. My purpose was not to copy her but to use her as a reference. 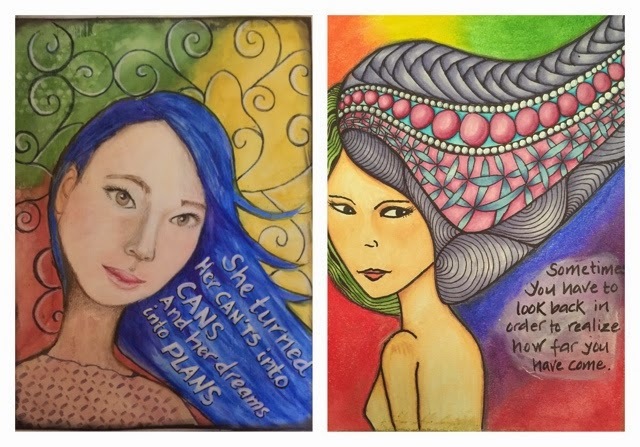 As with other pieces from the Wiman of Wisdom series, I created her hair with using zentangle patterns. 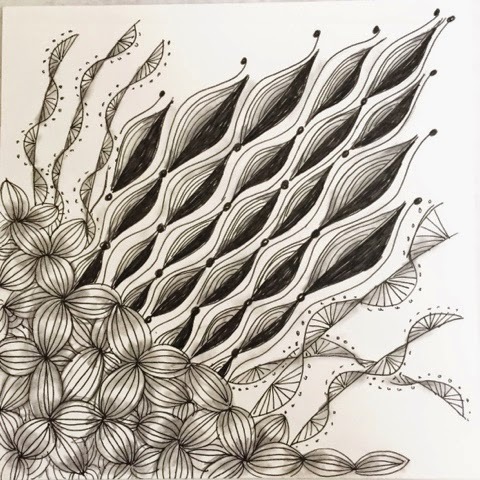 I usually don't like to use a pencil but in this case, I had to make sure the zentangle patterns used looked interesting. I used Derwent Inktense to color and Prismacolor colored pencils for details and shading. The quote used describes a bit about me, I think. For my new art journal piece, it seems I've broken a very important rule in composition - the rule of three. 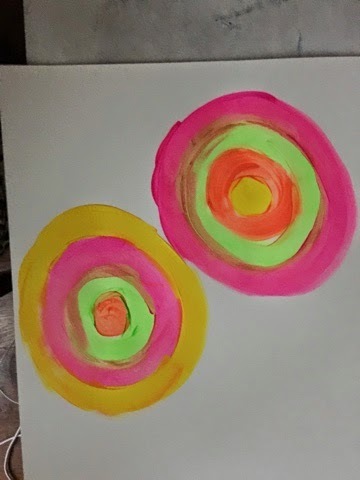 I've never taken a formal art class, but even I've heard of rule of three. 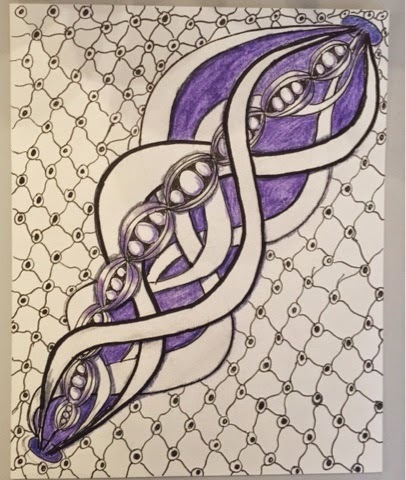 That just means that you repeat a pattern three times which always produce something pleasing to the eye. Even in decorating, I've read in magazines or heard decorators on HGTV talk about placing a grouping of three objects to create a vingnette. It's not clear to me why I chose 4 heard on each page. And not only that, I created only two varieties of hearts. Another even number. Who knew I was such a rebel? In this piece, I also broke away from my normal methods. 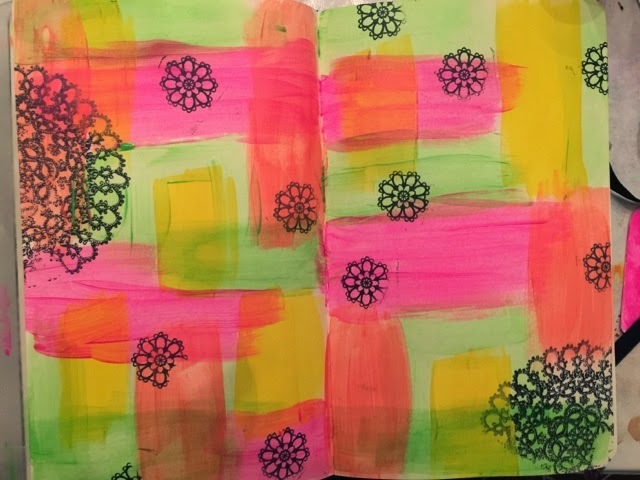 For example, when I create a background with an ink spray, I normally spray directly onto my paper, mixing and layering my colors. But for this, I decided to spray on a non-porous surface (freezer paper, wax side up), and rub my paper on it. 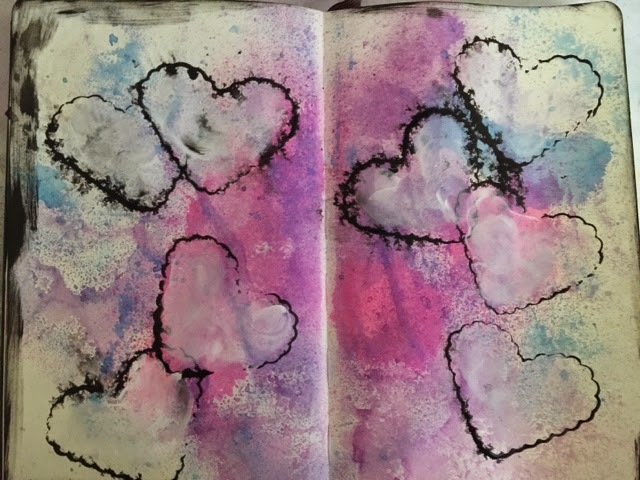 I usually don't like to have white spaces in my art journal, but I'm experimenting, getting out of my comfort zone. Next, I used my heart cookie cutter and used it to stamp with acrylic ink. The reason I used acrylic ink and not my inkpad was because I wanted to blur the black lines with water before it had a chance to dry. 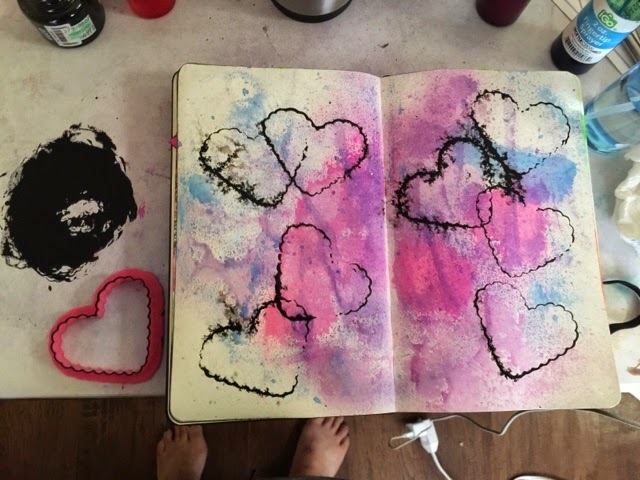 These inks take a while to dry so even after stamping 8 hearts, they were still wet enough to that when I spritz the pages with water, the ink ran. This is a first for me too. I usually work with clean crisp lines. I loved how the inks bloomed! 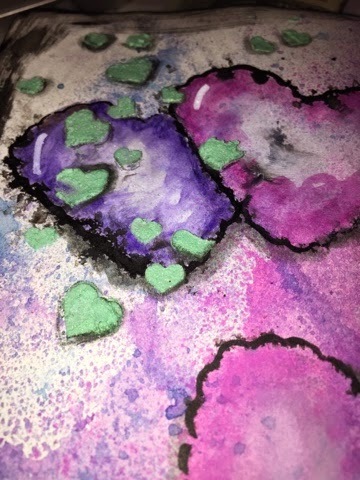 I then gessoed inside the hearts. Once that dried, I added color with inktense pencils. My next set of hearts came from mixing light molding paste with PearlEX shimmery pigment powder. 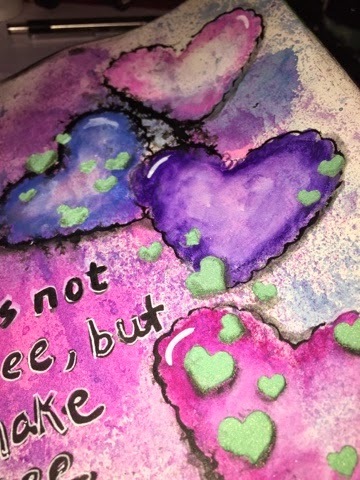 Using a Heidi Swap stencil, I added 3-D hearts. 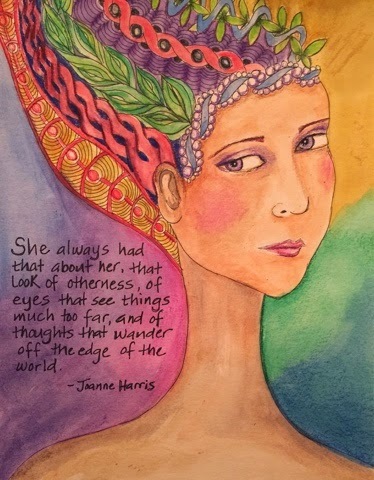 The last step was to add shadows and the quote by Degas. I love this quote because it gives artists power to influence and convey ideas with images. 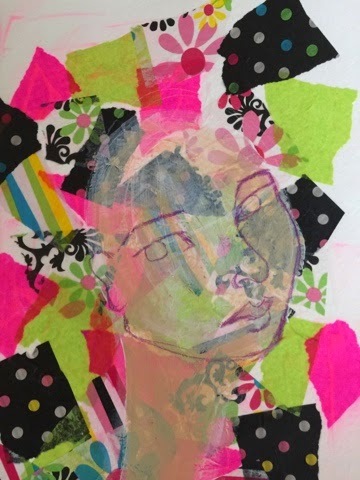 My friend Suzala said in a comment that (I'm paraphrasing her) as artists, we participate in the realities we create and I love that. 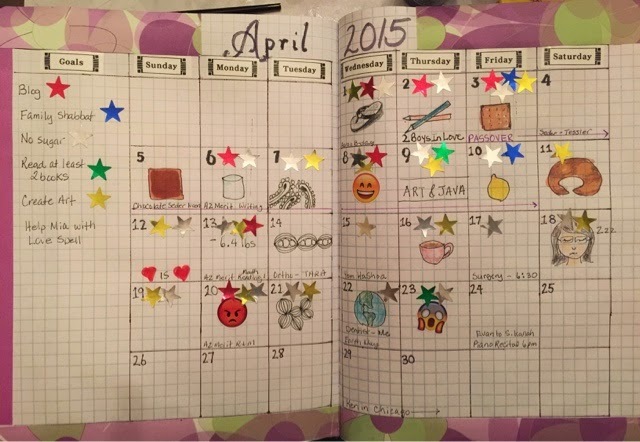 Earlier in the month, I blogged about my new daily planner/journal, aka Fauxbonichi. I wanted to update on how it's working and not working for me. 1. Keep me organized - important dates, daily to-do's. No matter how old I am, I still love seeng all those stars indicating I worked toward a particular goal. I do need to rethink using stickers because I run out of certain ones faster than others. I love having a specific place for my daily todo's. Having a daily prompt. This month in the Fauxbonichi Group on Facebook had a daily challenge to describe or draw whatever asked. So for April 11th, the prompt was to describe or draw your favorite place where you live. I chose my backyard. 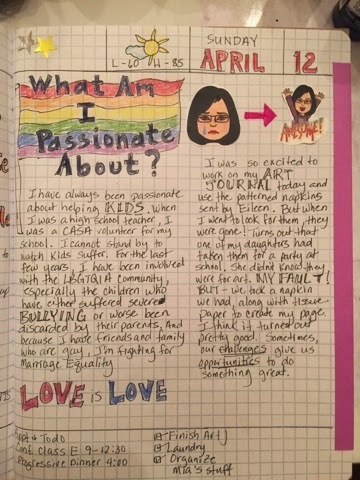 Having these prompts give you something to draw or journal about. Having one page per day is limiting. By the time I draw my daily prompt, I have very little space to add daily highlights. 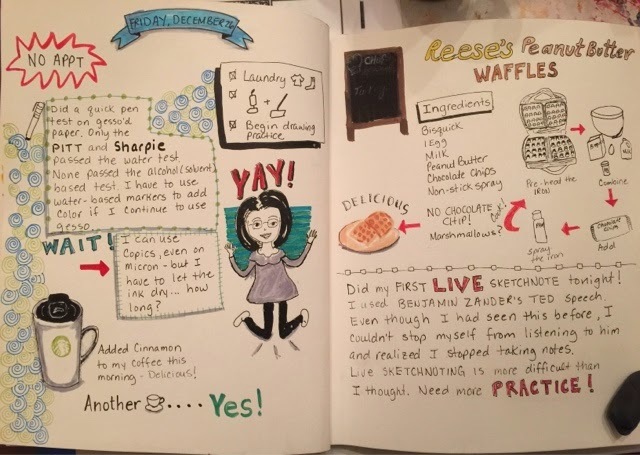 In my previous planner, I used to have a quote of the day, my dinner plans, and other daily happenings. Here's an example. The composition book paper really isn't ideal for art. It's really thin and the page will disintegrate when you add any water-based media. I have used gesso to strengthen the paper, but that's not an ideal solution either. The art block that I add to my daily page adds lots of bulk. 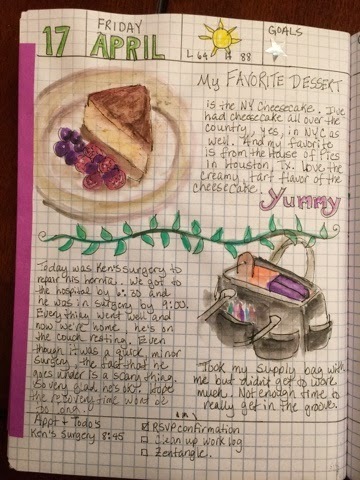 I do enjoy seeing my art inside my journal, it does limit the size of my art and the thick watercolor paper does not want to be held onto thin composition paper. So what I've decided is to use a Miquel Ruis gridded journal, keep my monthly page, use two pages/day format and add a few more features. 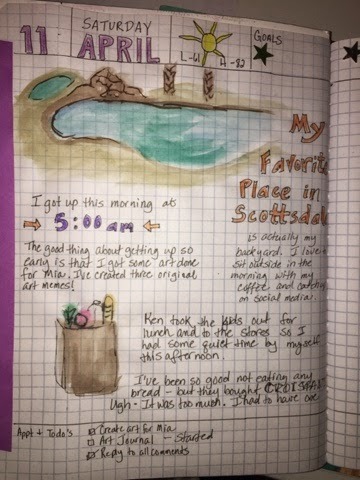 Here are few of my other daily pages. May is quickly approaching and I will be excited to start a new journal and a new layout. 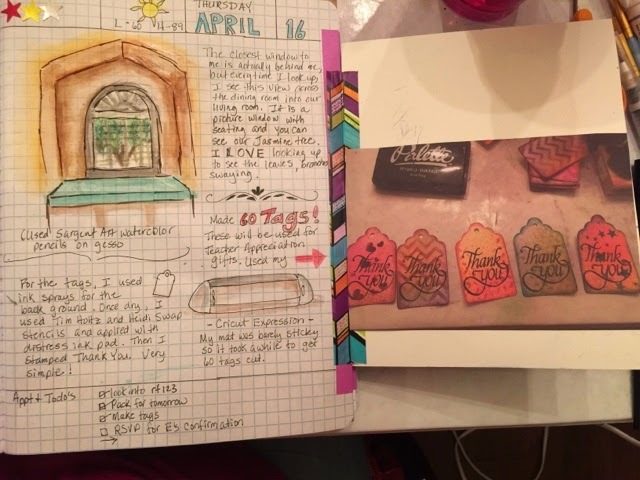 When I'm working on my art journal or any art piece, I take lots of process photos, partly to document how I created the piece, but mainly to see my art from the viewer's perspective. What does that mean? And at this point, you might be questioning my sanity... Isn't she already seeing the art through the viewer's perspective? I don't know about other artists, but when I'm drawing or painting, I become myopic, only able to see the part that I'm drawing. And that's probably why I will never be an urban sketcher, who can sit at an outdoor cafe and sketch the beautiful scenery in front of her. When I take a photo of my art, I can see the whole and it helps me to make adjustments. Sometimes things aren't in the right proportions and other times, it's just adjusting the lighting. As an artist, I have a vision in my mind (most of the time) and sometimes, that vision is the lens through which I see my art. And it isn't until I see the photo, that I see the piece as it is. Which reminds me...my oldest and my youngest are very much alike... Strong-willed, very sensitive, and they both have difficulty letting things go. (She really has lost it, she went from talking about art to her children...) They are constantly bickering, trying to get each other in trouble. They both don't like to acknowledge that they are very similar in temperament. Several years ago, during one of their heated arguments, I recorded them without being noticed. Once things cooled, I showed them the video. They were both horrified that I had recorded them, but once they got over it, they could see similarities in the way they behave towards each other and that the things they find the most annoying about the other is the same exact things they do. Whether it's art or your relationship with others, sometimes you have yo step back enough until you see things as they are and not as you expect them to be. 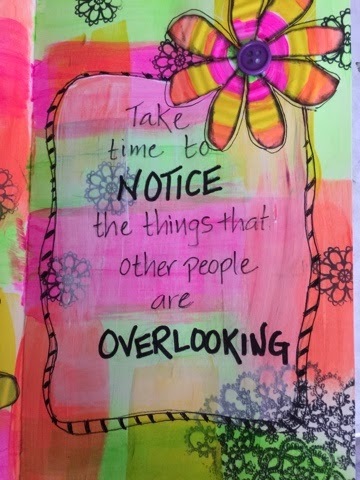 And that leads me to the question, Can you be an observer (like my quote above, observant enough that you notice things overlooked by others) at the same time you are a participant? When I was a teacher (this is the last anecdote, I promise) I got to learn processes and protocols that engage a group of people in a dialogue. One of those processes is called the Chalk Talk. There is a huge butcher paper on the wall with the question or topic in the middle. Participants are not allowed to talk. When you want to respond to the question, you go up to the butcher paper and write, creating a web. There are only a certain number of markets available so you have to wait your turn. When you want to respond to someone's remark, you form a new web. I've participated in and facilitated many Chalk Talk sessions. It's a great to 'hear' from those who feel intimidated to talk in most sessions. It's also a good way to limit the loud ones who tend to overtake the group. In this instance, you are both a participant and an observer, but not at the same time. It forces you to step back and read what others wrote. Of all the processes I've facilitated, this is always everyone's favorite. 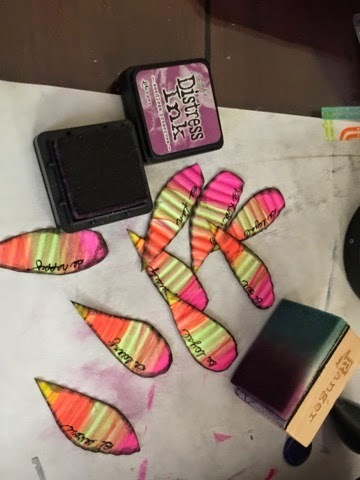 I started with stamping using archival ink. I just purchased a set of neon paint so Ivwanted to give it a try. 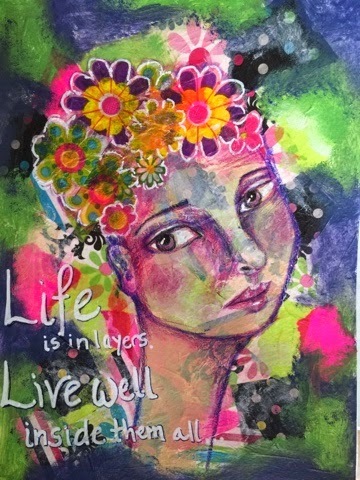 I layers several colors by alternating horizontal and vertical strokes. 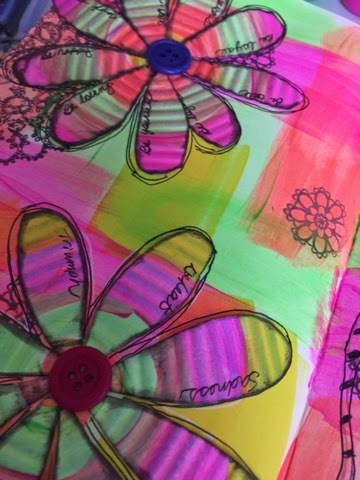 I decided to create flowers using the same colors so I started with circles and cut out petals which Went through my paper crimper to get the corrugated look. 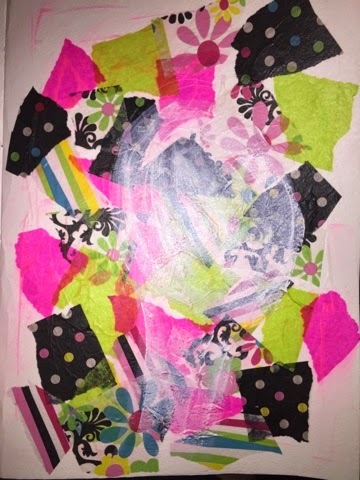 I used a my inkpads to outline the petals and used Tim Holtz distress ink pad to hit the bumps. 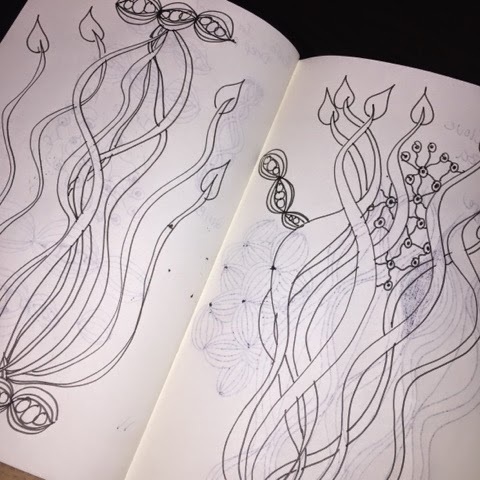 Two of the flowers were placed on the left page. 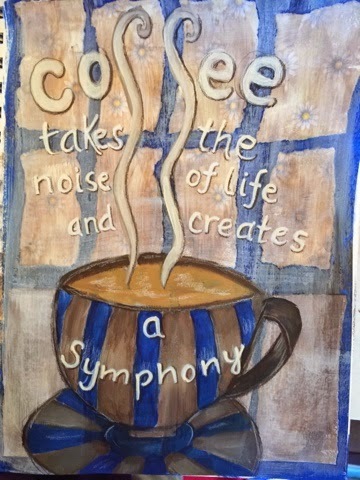 I created my 'frame' for the quote with gesso. Here is a closer look at the petals. 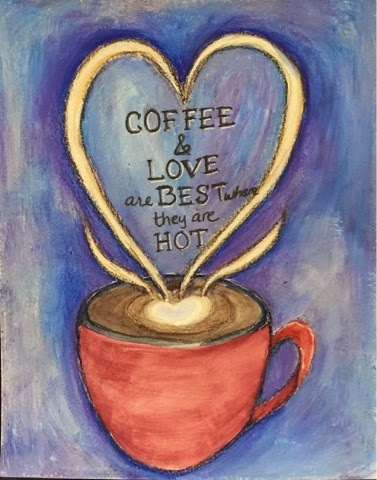 If you know me at all, you know I love coffee! I've loved it since high school. There is no other scent or flavor that signals the morning for me. In college, my coffee maker was continuously brewing for me and my podmates. We didn't care what brand of coffee we used, we were only interested in the liquid fuel. When I became a teacher, I started out taking a thermos of coffee. When that wasn't enough, I brought my own coffee make for my classroom. I remember my Chem 2 students were concerned for my health, so I assigned them to extract the amount of caffeine I was consuming a day. Needless to say, it was more than what was recommended. The only time I quit drinking was during my pregnancies and during my nursing period. Most were shocked that I had more than one child. I rarely drank decaf because I thought the residue from the chemicals used to decaffeinate the coffee would be more harmful than the actual caffeine. Today, I use the Keurig. But I stopped buying the pods because you can't easily recycle them. So now, I use my handy attachment to make my own pods. I actually like making my pods because I can adjust the intensity of my brew. 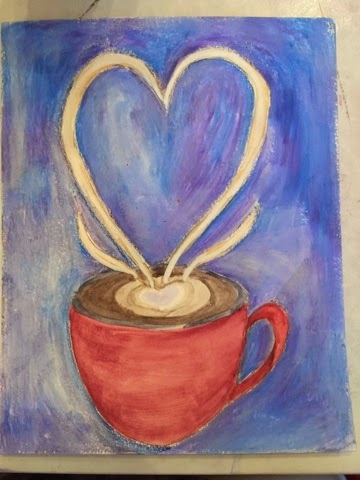 So with all this love for coffee, I was somewhat surprised that I had only done one art piece with a coffee theme before the one you see above. Here's my previous one. 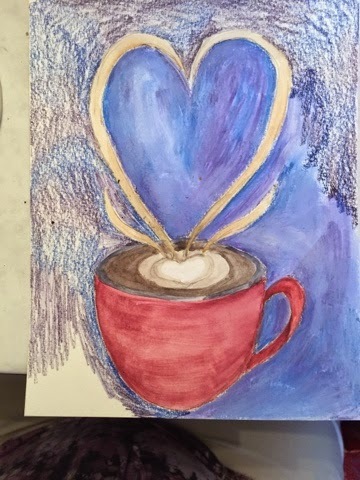 I think I'm going to do a series of these coffee-themed art. Should be fun! 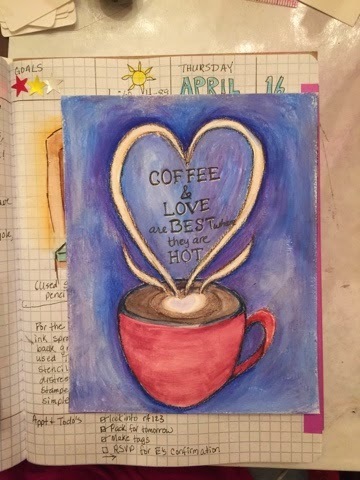 For today's piece, I used my new favorite art supply - Derwent Inktense Pencils. These look like colored pencils, but they activate with water-based media and when dry, they are permanent because the pencil is ink-based. 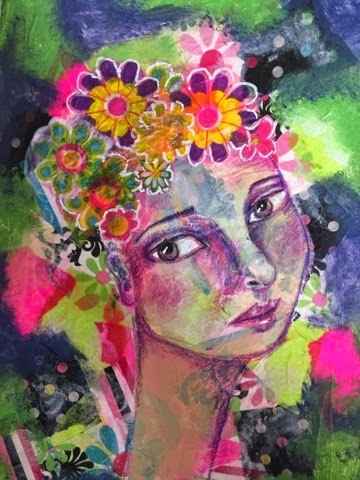 One of my favorite techniques I use with Inktense is to activate with gesso, which produces a softer look. If I had activated this with water, the color would have been much more intense. Gesso, which is an acrylic base, is milky and gritty. It's almost like using white paint with ink. Now it's time to add details and depth. I wasn't really going for realism, just to make it look plausible. For this, I used colored pencils. Because I used gesso, the colored pencils go on darker. And I blended them with rubbing alcohol. 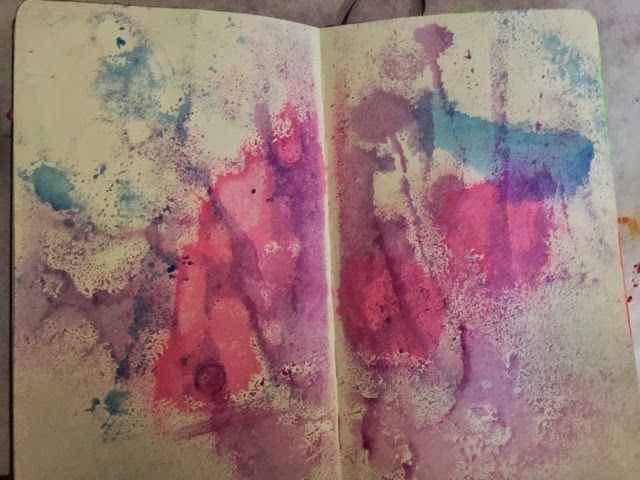 What's nice about using rubbing alcohol is that it has enough water that it will also activate the remaining Inktense. The result is what you see above. The quote is a German Proverb. I chose this after reading my friend, Brad's blog post on Wednesday. When the relationship is new, the spark is always there. And when you've been married for 17 years sometimes you have to stoke the embers to get the fire going again. 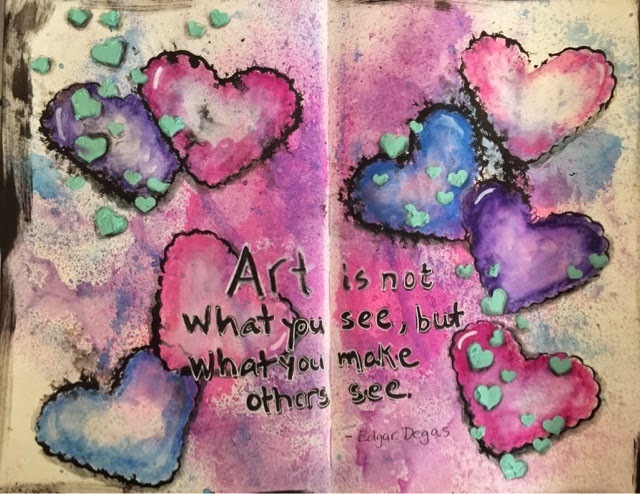 I finally got a chance to work in my art journal this past weekend. 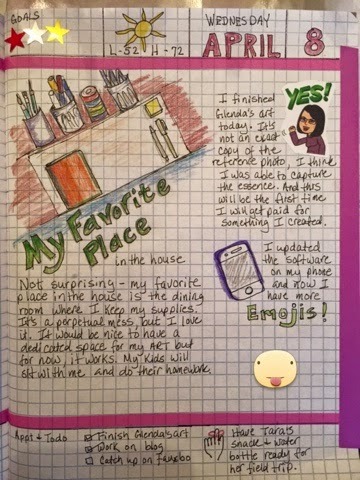 I do draw or paint something small everyday in my Fauxbonichi (my daily journal), but working in my art journal is a total creative process. I've been thinking about layers lately. My thought process has been to peel the layers away until the core me can emerge, not the person who everyone expected me to be. But to do that, you almost have to deny or minimize your previous experiences. I don't think that's what I want to do. Instead, what I think I want is for all the layers to show through, not hiding any of it. From my serious, very scientific layer, to my whimsical childish layer. Instead of peeling all the layers away, let's find a way to harmonize the layers. Well, that was my thinking as I started this piece. 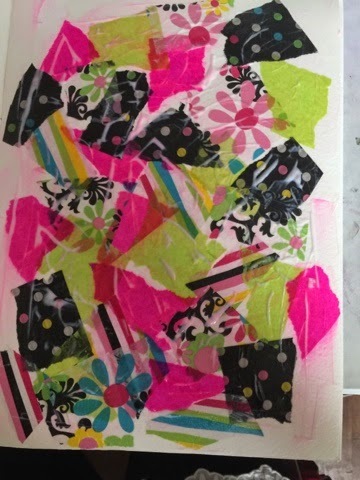 I started with a layer of coordinating tissue paper pieces placed randomly with matte medium. Once dry, I lightened the face and neck area with gesso. 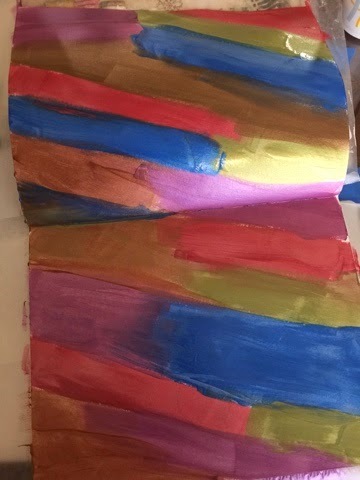 I used only a thin layer so that I could still see the tissue paper layer. I then applied a thin layer of acrylics in flesh tones and outlined my face. I added a paint layer to frame the picture a bit better. I used Tim Holtz paint daubers in Chipped Sapphire and Mowed Lawn (you gotta love those names!). 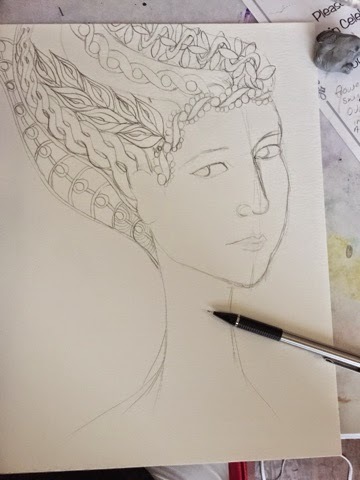 At this stage, I usually work on the hair. But instead, I decided to add more layers with patterned napkins. 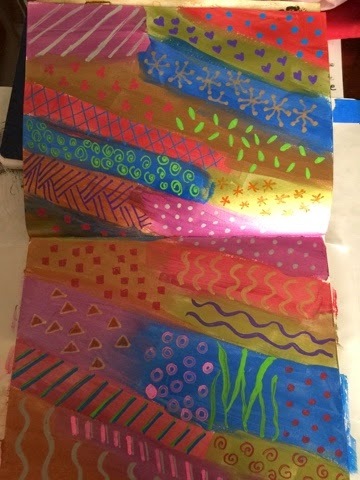 A friend of mine had sent me several beautiful patterned napkins she had left over from her art journals. I was so excited to use them. But when I went to look for them, they were gone. After asking around, I found out that my youngest had taken them to school for a party. They were already in a Ziplock and it wasn't labeled. We were both upset, me for not labeling the bag and my daughter because she took them. But instead of sulking, we decided to look through out stash to look for napkins we could use. It really was my fault for not putting those in a special place. 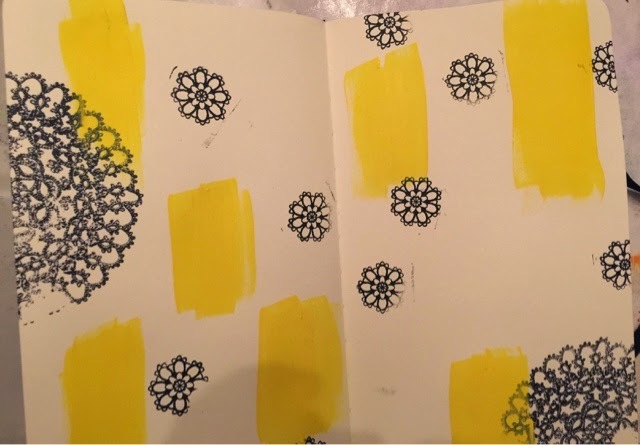 I used a white sharpie pen to outline the flowers. The final touches were made with colored pencils and the white sharpie for highlights. I think the end result turned out well. 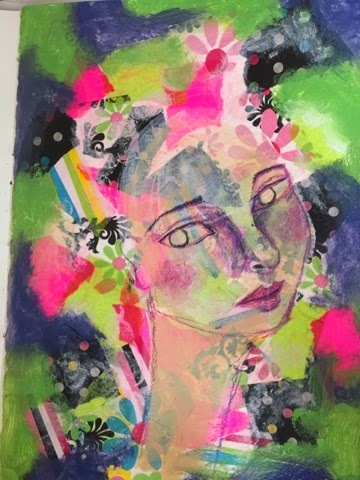 I'm happy that all the layers are visible, each adding to the richness of the piece. I think that's how I want to be, with all my layers showing through. And the quote summarizes my feeling. So far, 2015 has been a tough year for our family. I'm usually an optimist, but for the first time in a long time, I felt depressed, totally withdrawn. 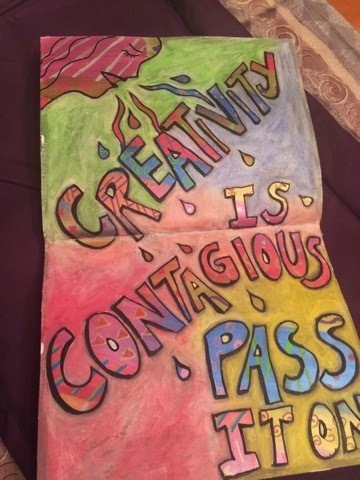 One thing that has helped me is my art journal. It's a way for me to express my insecurities, my worries, my frustrations while I try to stay strong for my family. The piece you see above was done earlier this year. It started out like this. These are just a few emotions I was feeling. I then wrote my heart out in the blank spaces, pouring my anger, frustrations, my fears. It just felt so good to get all of it out. I then covered my journaling and parts of the words I initially wrote. 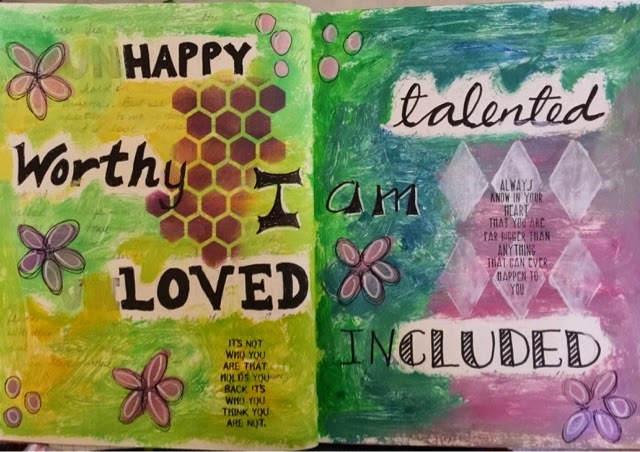 I turned my negative thoughts into affirmations. It's a simple excercise in changing your mind set. And it was very therapeutic to voice my feelings, even if no one was there to hear or read it. And the act of painting over parts of those words lifted my spirits. I believe in art therapy. 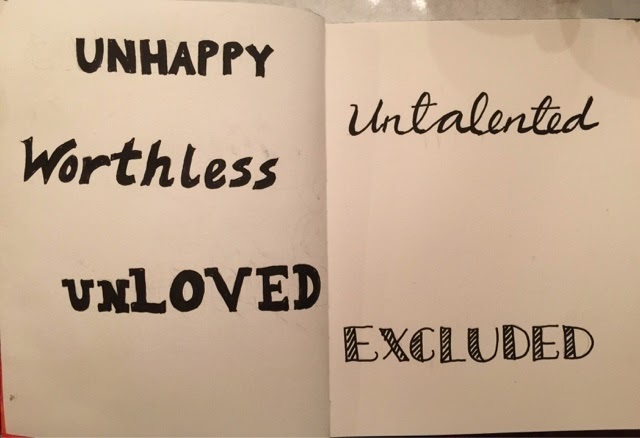 I know child psychologists use art to get their young patients to draw their feelings. 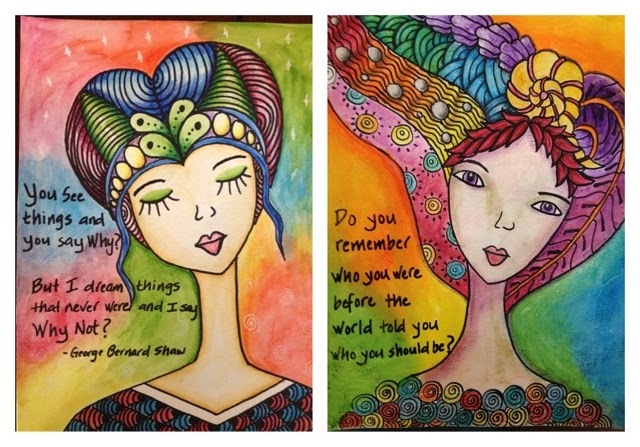 Artists like Paul Richmond use art to help kids express the impact of bullying. Perhaps it's because I'm an introvert that I always had difficulty expressing my doubts and negative thoughts to others. Or maybe it's a cultural thing, as many Japanese believe in keeping emotions to themselves. Whatever the reason, I feel good knowing that I now have an outlet. There are other pieces that I've done during this period that helped me cope with various issues I've faced. 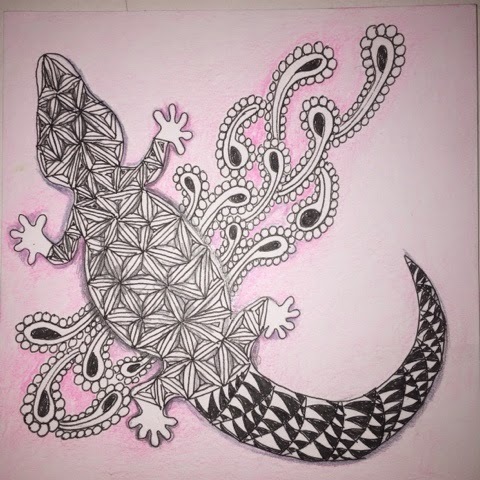 I hope that you'll give art therapy a chance too. Don't you love being around creative people? I certain do. When I taught high school many years ago, I belonged to a group called the Math/Science Fellows. As the name implies, it was a group of math and science teachers from all across the country trying to learn a different way to plan a math/science curriculum. You wouldn't think this would be a creative bunch. Just think back to the math and science teachers you had in high school. I would bet many those teachers put you to sleep. I might have been one of them. But I was determined to make learning exciting, if not meaningful. 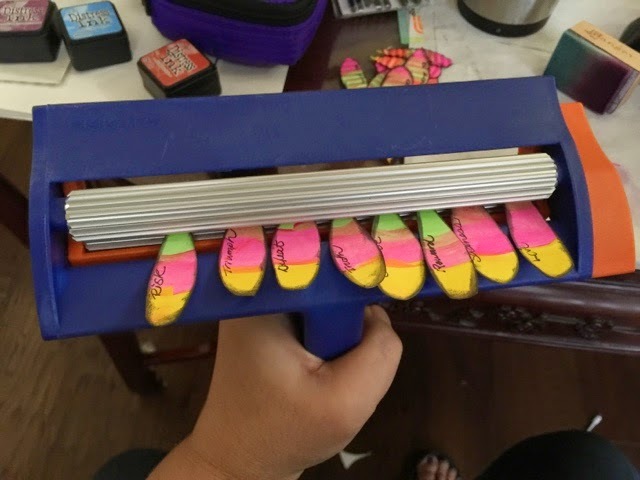 So this group of math/science teachers were tasked to create curriculum that integrated math and science concepts and skills and had real-life applications. We committed to a two year program to learn how to get out on those skinny branches and try something new. It wasn't easy. But the whole experience had a life-changing impact on how I view education, even now. Once you let go of those long held notions about how things ought to be, you begin to see other possibilities. Being with those teachers, generating ideas, having a true dialog about teaching and learning, and creating curriculum and programs were the best learning experiences I've had in my life. 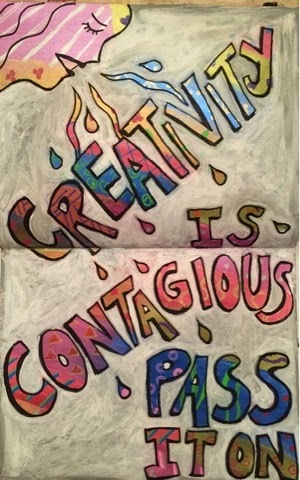 So I truly believe in the quote by Albert Einstein that creativity is contagious. 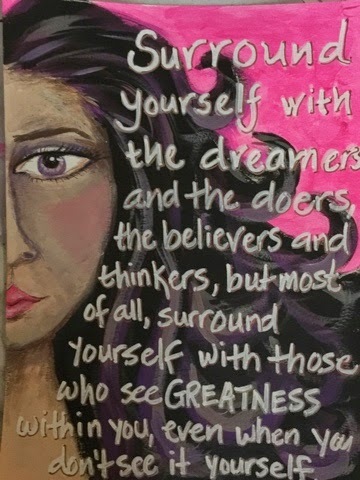 When you surround yourself with creative people, you catch a little of bit of that creativity too. Even for math and science teachers. 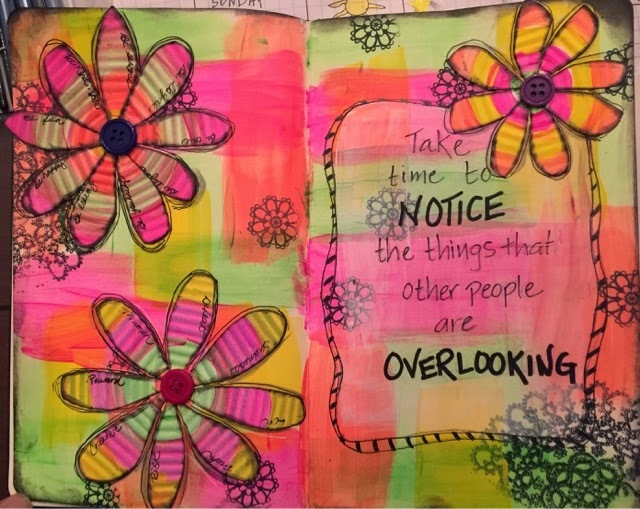 So let's take a look at my art journal piece. I began by randomly painting metallic acrylics on my pages. The next was to use paint pens to doodle on top. Since the quote was about spreading a contagion, what better image than someone sneezing? So I drew and wrote the quote with a black Sharpie. Then I applied gesso to the negative space. The process is called under painting. You create a background first, create an image, and bring out the image by getting rid of the negative space. This is a good excercise for me because it helps me let go of control. It's a very freeing experience not knowing exactly how a piece will turn out. I finally painted the negative space with contrasting colors and shaded the image and texts to create the final piece you see at the beginning. 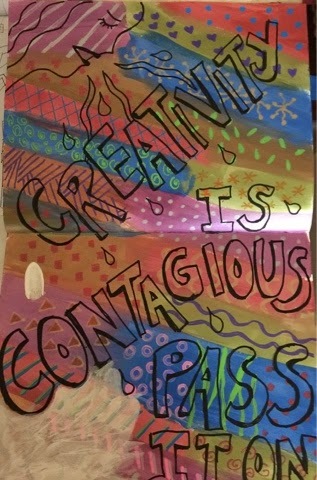 When was the last time you felt creative? When was the last time you went out on a skinny branch?